All the dimensions received similar scores in a range between 57.11% and 60.79%. 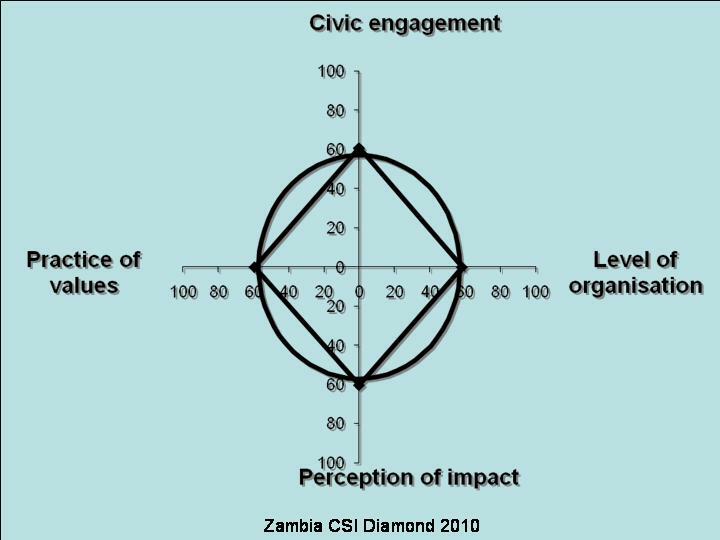 The relatively low score for civic engagement has been credited to the fact that most people in Zambia spend more time dealing with meeting the pressing need of making a living in a country with widespread poverty. Despite this low involvement however, civil society in Zambia is very organised with established infrastructure and communication, however there are still problems in terms of transparency in CSO decision making as well as financial and human resources challenges. CSOs in Zambia are seen to practice democratic values, and to have significant involvement in policy processes, despite the lack of institutionalisation of their participation. In as far as the external environment is concerned, it was found that the socio-economic, political and cultural context is not enabling the full realisation of essential civic and political liberties. A revision of the NGO Act is cited as one of the recommendations in the report in order to accommodate the various types of CSOs in Zambia. It is also suggested that Zambian CSOs should lobby government to institutionalise citizen involvement in the policy making process. Dialogue between state and civil society is needed particularly on issues of governance, participation, human rights and the rule of law. The Civil Society Index (CSI) was implemented in Zambia by the Zambian Council for Social Development, with financial support from the United Nations Development Programme (UNDP) and technical support form the CIVICUS CSI Team. This entry was posted on March 30, 2011 at 1:10 pm	and is filed under Africa, CIVICUS News, Reports. Tagged: Country Reports, CSI project, Publications, Zambia Country Report. You can follow any responses to this entry through the RSS 2.0 feed. You can leave a response, or trackback from your own site.